The Business of Real Estate is a Business of Trust and Authenticity; it is anchored in your interactions and your authentic self. Yes, as the Real Estate Professional, you must be knowledgeable, punctual, dependable, technology savvy, and a great resource of Local Real Estate Information – but that’s not enough; customers want that feeling that they are working with someone they trust. Your humanity is your best asset in being helpful to customers – they are not hiring a machine; they are hiring you. Trust is fomented in the conversations and back and forth correspondence you nurture with your clients; and the biggest culprit is deals going awry is poor or bad communication. 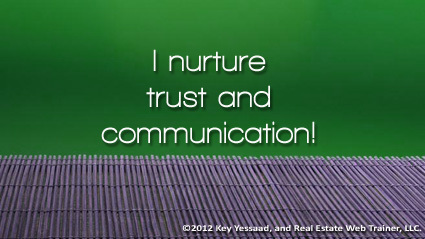 Nurture your relationships and trust will be present!